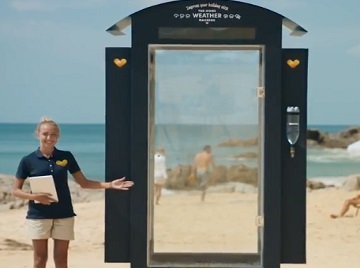 Thomas Cook shows people, in a new spot, what happened when they took their Home Weather Machine and simulated snow, rain and storms to unsuspecting holiday-makers on a sunny beach abroad. The ad opens by revealing the outcome of a 2018 Cint survey, that shows 47% of respondents enjoy their holiday more when the weather back home is bad. With this in mind, the global travel company have invited people to experience their actual home weather in the Weather Machine, which is designed to show the weather in a specific town/city around the world using an online weather service and simulate all kinds of bad weather, from rain and wind to thunder and lightning, fog and snow. To make the experience even more authentic, rain water from “back home” has also been used. “It’s one thing to see a weather report but another thing entirely to feel it on your own body. This really makes you appreciate that you’re not back home in cold Britain, but enjoying life on an exotic beach,” the voiceover adds says at the end of the spot, asking then “Now doesn’t that make you want to book your next holiday?”. Thomas Cook Group, which the third largest travel company in the UK and Europe, behind Thomson Travel which later became TUI Travel and Jet2 Holidays, owns a number of tour operators, as well as airlines based in the UK, Belgium, Germany, and Scandinavia. It also owns the booking website Hotels4u.